The editors of Y! 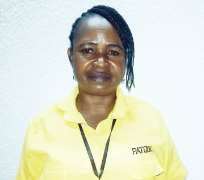 – TV and Online – today announced the Y!/YNaija.com Person of the Year 2015 – and it’s Josephine Ugwu, the 36-year-old airport cleaner who returned N12m cash to its rightful owner. The Y!/YNaija.com Person of the Year is in its fifth year and is awarded this year to the individual who has most visibly influenced the Nigerian society for good in the past year, breaking new boundaries or consolidating on gains – and driving the advancement of the public, especially young people. For the first edition in 2011 there was no winner. The 2012 winner was entrepreneur and Africa’s richest man, AlikoDangote. The 2013 winner was tech industry trailblazer, Jason Njoku and the 2014 winner was Obiageli Ezekwesili for championing active citizenship and entrenching the idea of the ‘Office of the Citizen’. Nominees for the Y!/YNaija.com Person of the Year 2015 were former President Goodluck Jonathan, Bola Ahmed Tinubu, Attahiru Jega, Ibukun Awosika, Bunmi Akinyemiju and Kunmi Demuren, Aisha Jummai Al-Hassan, Rotimi Chibuike Amaechi, Simdul Shagaya, and Bishop David Oyedepo. There is no award ceremony for the Y!/YNaija.com Person of the Year 2015.